I decide to skip a few tourist attractions in Bangkok. “Nothing to see here,” I’m told by the owner of Jenny’s restaurant in the same alley as my Bangkok hostel. I don’t have high expectations but to hear from a local that I should not spend much time in Bangkok is a bit of a kick. My hostel is near but not too near the infamous Khao San Road. There you will find backpackers walking the streets with beers, men aggressively soliciting tailored suits, bars that serve pizza and margaritas, pad thai served from street carts, and just a large mess in general. It’s hard to believe that anyone would want to stay on this street, let alone spend any more than a few minutes on it. I am eager to see what the city has to offer, but transportation within Bangkok is damn near impossible. Traffic is at constant standstill, the city so vast and hot that walking is out of the question, the air so polluted and the streets so chaotic that cycling is at your own risk, and the cost of tuk-tuks at exorbitant rates for foreigners. The only viable option I have, since I’m not even close to any of the cities elevated trains or monorails, is metered taxi rides. These are reasonable if you make sure the driver turns the meter on, but slow because of the traffic. I walk through some regular markets with electronics, foods, knick-knacks, everything really. Wat Chai Wattanaram on the opposite banks of the river from the island of Ayuthaya. 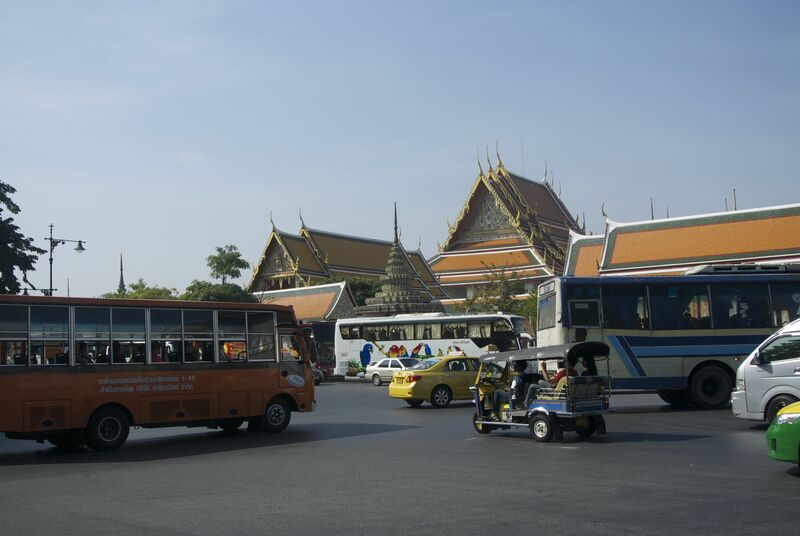 At the royal palace and the surrounding temples I’m amazed by the number of tour buses. A man at a desk on a corner who looks like he is supposed to be doing something says hello. I’m apprehensive that he wants something from me, but he really just wants to talk about American action movies. He likes Vin Diesel. I continue walking, passing on visits to all the museums and sites mobbed by tourists. I see along my walk what seems like dozens of photos of the King, at various stages of maturity throughout his life. He is beloved beyond doubt. After his death, the political situation in Thailand will certainly turn interesting. My main goal in town is to obtain a visa for Myanmar, which I accomplish without incident. (here’s how on thiftydrifters). I have the urge to explore the embassy district and the nearby areas, but I’m exhausted by the heat, the traffic, and the cynicism of Bangkok. I hop the train to Ayutthaya, a few hours north of Bangkok. I sit 3rd class. I watch all the vendors go up and down the aisles, people coming in and out at provincial stations, as the countryside goes by after we finally have made it out of the big city sprawl. About a block from the train station is a ferry across the river to the island of Ayutthaya. Before Bangkok was the capital of the area Ayutthaya was supreme, it’s strategic position as an island protected it from intrusion (until 1767 when it was sacked by the Burmese). The one-minute ferry ride is probably the most charming part of the town itself. I rent a bike and cycle around the ruins. Some of them are rather impressive. They are spread out around the town. There are a number off the island. I visit a few until the heat and the general malaise of the town gets to me. I call it a successful day and have a few beers at “Street Lamp” where there is a live set of some American folk favorites. It feels like just back home, being sung folk songs by an old Thai man with hair down to his shoulders. Eager to move on, I hop the train to Lopburi. My guidebook says that it is relaxing and a respite from the tourist buzz of Bangkok. The upcoming weekend there is supposed to be an annual festival celebrating the monkeys. Macaques inhabit part of the town – the sites of two ruins in particular – and at night monopolize some of the nearby sidewalks. They climb on power lines, jumping around eating and drinking whatever they can get their hands on. Locals mostly beat poles against the ground to scare them off. When I ask my guesthouse about laundry, the proprietor says she doesn’t offer the service anymore because the monkeys would steal all the clothes. Hmm. It is relaxing inside the old city walls of Sukhothai. I spend too long in Lopburi waiting around for the monkey festival on Sunday, which is a sweaty, boring affair. This is not an ancient celebration, but a modern festival contrived in the 90’s, most likely to drum up some tourism for the town. There is a large show: music and dancing in traditional dress. 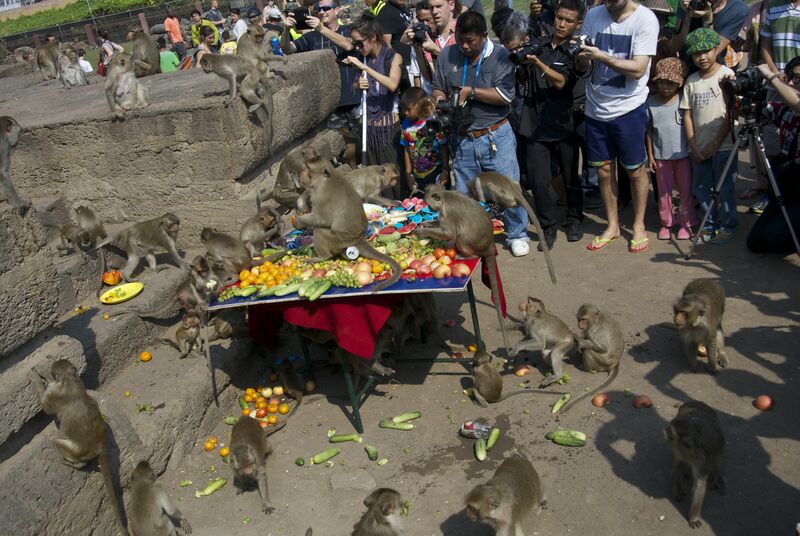 Then a long drawn out ceremony to feed the monkeys a feast. This is not worth the wait. It is like chasing around a mouse trying to get a picture of the spot on its back. Leave the photos to the pros. I’ve seen monkeys eat before. I catch another train. After catching a bus from Phitsanulok where the train drops me, I end up in Sukkhothai. The next morning I take the bus into old town to explore the ruins. I’m getting a little worn on looking at crumbling buildings in the hot sun, but Sukkhothai is a treat. The ruins are well maintained and within the city walls all the roads are shaded by trees and well paved. I ride my rented bike around to the sites, past lakes with lily pads and bridges to temples built on tiny islands. I get adventurous and venture outside the walls to see some of the other sites that are recommended be visited by motorbike. I take a wrong turn somewhere and end up on a quiet road going through farmland. I know it’s the wrong way, but I continue for a while because it’s so nice. Eventually, I turn back and find what I’m looking for. Content that I’ve seen enough ruins in Thailand for the time being, I set my sights on Myanmar. This entry was posted on December 22, 2014 by alexjparton. It was filed under Asia, Thailand, Travel and was tagged with asia, ayuthaya, Bangkok, lopburi, monkey festival, ride the train, ruins, SE Asia, sukhothai, Thailand, thailand train, tourism, train, travel.